I have commented before that these days we’ve gotten so ignorant of our values, that we have largely forgotten the reason for our holidays. Even the president seems to have forgotten, because instead of paying his respects at Arlington, the way his predecessors did, he just went on vacation. Well, go ahead and enjoy your day off, your picnics and shopping trips, but here’s a reminder to at least take a moment to remember those who gave everything, so that you can live in peace and prosperity. 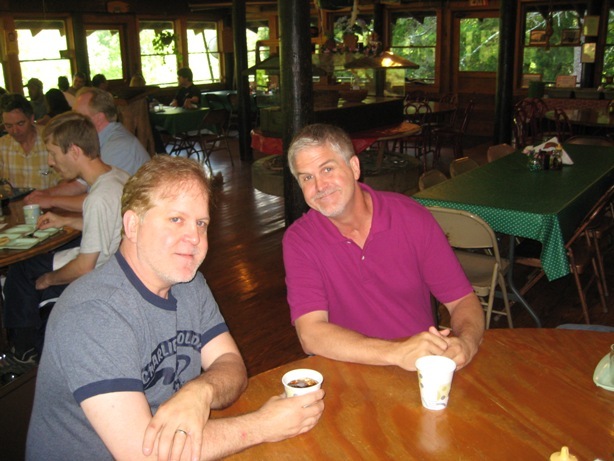 Last week, I told you about being on a men’s church retreat in the Kentucky mountains, from May 20 to 22, at a place called Aldersgate. The ladies, including Leive, went there last summer, so now it was our turn. Here are the best of the pictures I took over there. First, they had very nice cabins for us to stay in. Each cabin had four bedrooms in it, with up to four beds per room, but I don’t think we had to put more than two in each room. 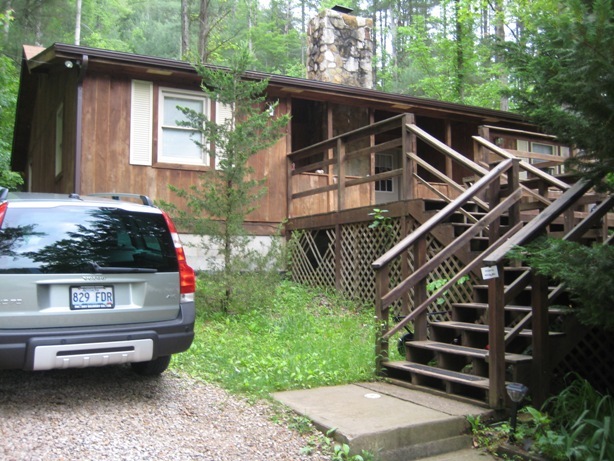 Here is the cabin I used. My pastor and most of the refreshments were in the other cabin. 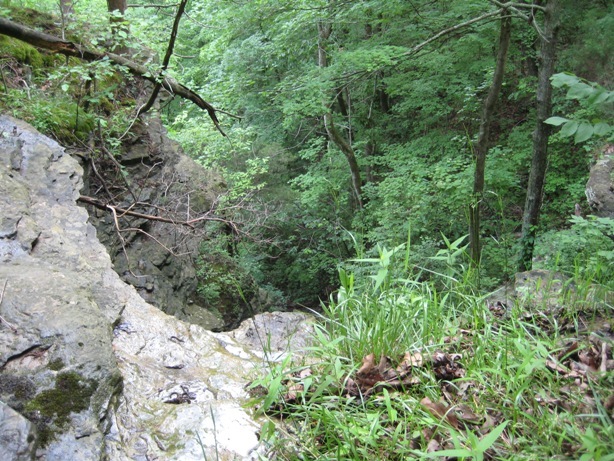 The campsite has several hiking trails, and at least two caves. On Friday afternoon I tried the trails. 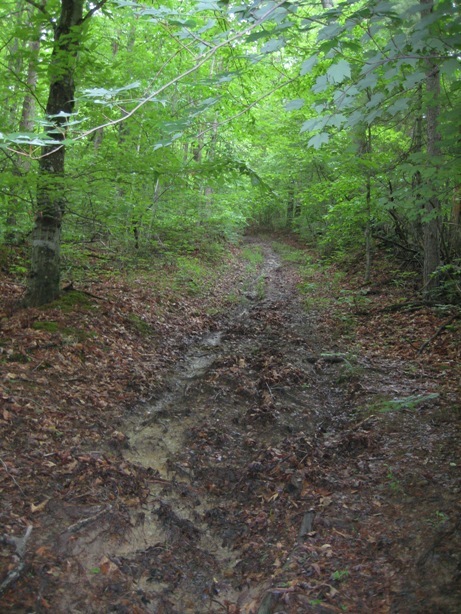 The trail I chose was quite steep, and because of all the rain we got in May, it was muddy, too. Consequently nobody tried going all the way up the mountains to the caves. Here is the first part of the trail; it was steeper, but better marked than the legs of the journey I saw later on. I almost stepped on the snake in the above picture. 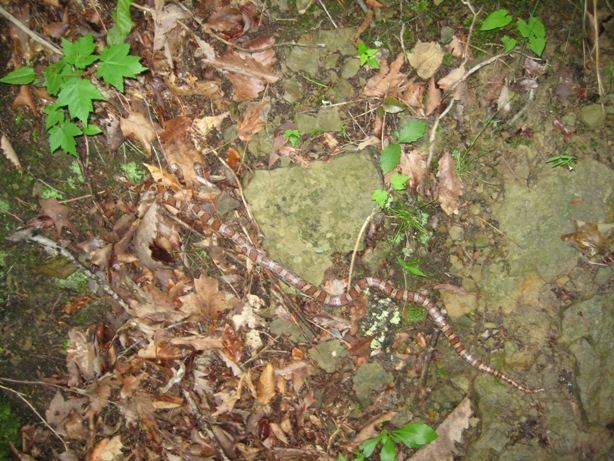 My hiking partner thought it was a copperhead, but because of the small head, it looked more like a red rat snake to me, so we left it alone after some unsuccessful attempts to scare it off by throwing sticks at it. 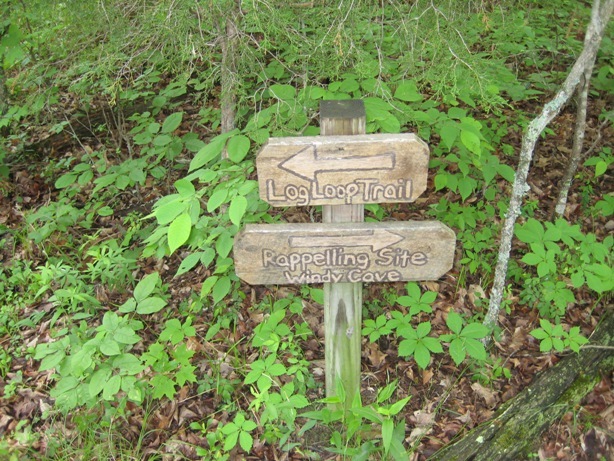 The trail we took, the Log Loop Trail, leveled off here, where we saw the last sign. After that, we weren’t always sure if we were on the trail, because it wasn’t marked, except for a few spray-painted trees. 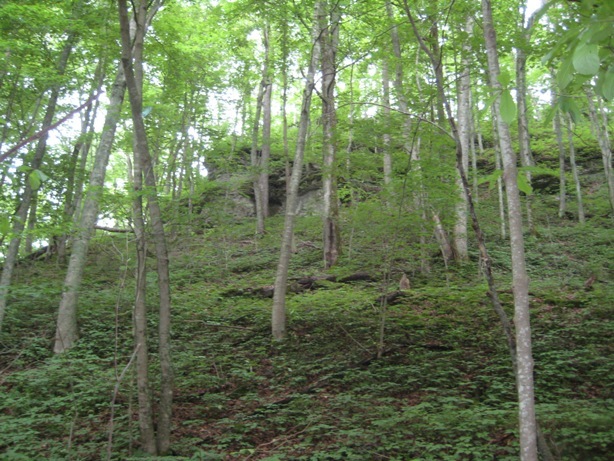 I think the closest we got to the top was when the trail skirted this outcropping. 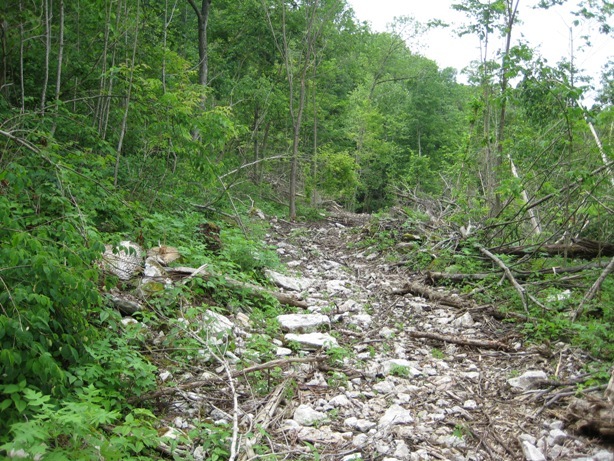 We came to grief when we reached an area where some loggers had ruined the trail by bulldozing down the trees. In the areas that didn’t have wood or stones, the mud was treacherously deep; I got stuck in it more than once. We didn’t see any markers to indicate where we should go, and the slope the bulldozers used was even steeper than the one we used to get up there. In the end we had to go back the way we came, for a hike that took three and a half hours. Afterwards I joked it was a male bonding experience that lasted too long! 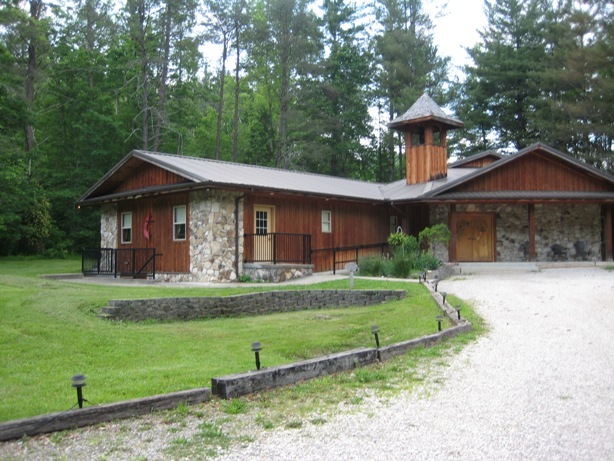 I also found out later that the loggers had come there without the camp’s permission, straying across the property line, so there may be a lawsuit on the way. On the way back I saw an immature newt, what folks call a red eft. We don’t have too many salamanders in Florida, so I was pleased to meet this fellow. The above picture is a close-up; it was only the size of my finger. I saw another red eft earlier on the hike, so for all I know it could have been the same one. It took quite a bit of cleaning up after the hike; I felt blessed to have the only room in the cabin with a washing machine. 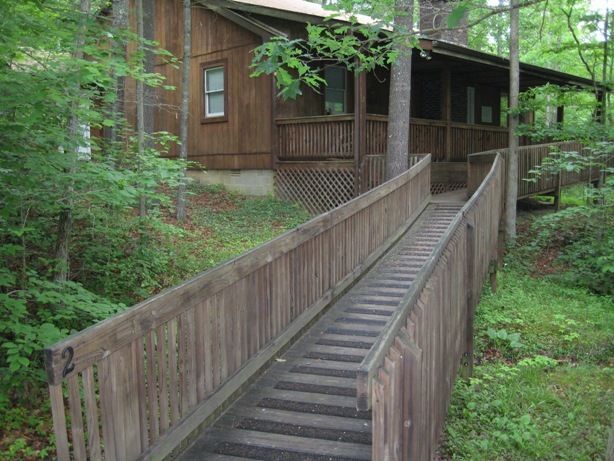 Anyway, the cafeteria where we took our meals is on the second floor of the above cabin. Between our cabins and the mess cabin was a run-down barn, which had four goats living inside. In the field behind it (not shown here) were some llamas and horses. 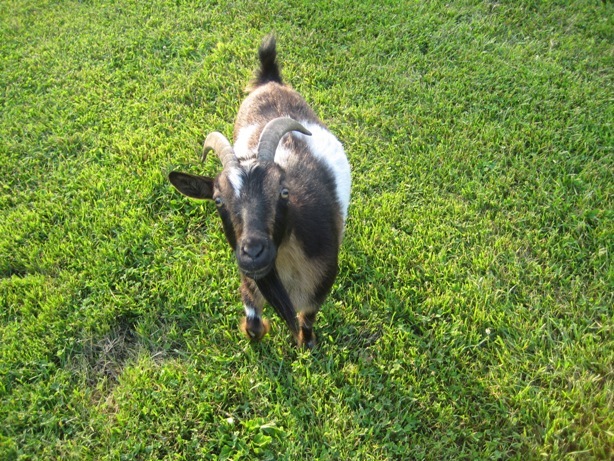 Who let the goats out? 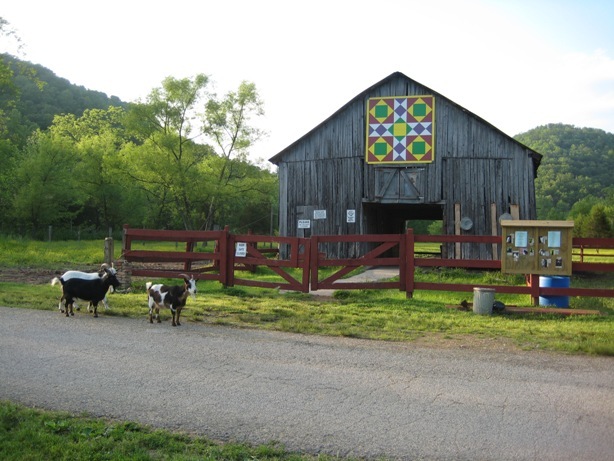 I found out that evening that the goats are free-range animals; part of the fence around the barn is missing, and they use that gap to go in and out as they please. One of them came up to me for a pat. Right after the Civil War, a town was founded here named Fitchburg, to mine and smelt iron ore. 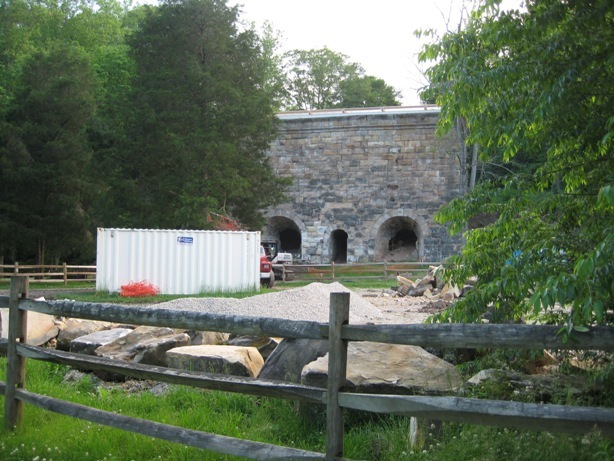 The smelter is currently being restored. I don’t think there was much iron locally, because the town was abandoned in the 1870s. Then in the early twentieth century, oil was discovered nearby, so Fitchburg enjoyed a second life until the 1990s, when the last of the oil ran out. The other main building at Aldersgate is this Methodist chapel; we didn’t go in there, though. 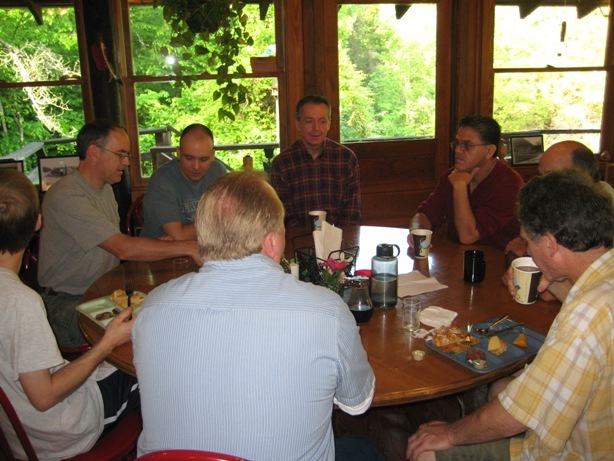 Here are several members of our group around the table, at breakfast on Saturday morning. Pastor Dave is in the rear center seat. Finally, here is my in-law Gene King (left), and his brother Roy. Roy is a pastor in western Kentucky, and he preached two meaningful sermons on the relevance of the David & Goliath story to men. All in all it was nice to “get away from it all” for a few days and recharge; I wonder what challenges this summer will bring? Here it is, history from Genesis to the present, in an animated video that lasts less than five minutes. I might do something like this, if I ever decide to make The Xenophile Historian an all-out multimedia website. You probably remember the movie “Kung Fu Panda” from a couple years back. What made it funny was the thought that one of China’s slowest animals could become a martial artist. The same idea worked for the Teenage Mutant Ninja Turtles. Now here’s a bear who seems to be inspired by the cartoon panda. This video came from a Japanese zoo, and I’m guessing it’s a Southeast Asian sun bear, from the patch on its chest. At any rate, the bear swings a mean bo stick! It looks to me like the moves are real, but the video was edited a bit to emphasize them. Unquote: Thanks to Lindy, Adam and Facebook, here are the latest videos of Lexi. Enjoy! There are all kinds of ridiculous laws on the books. Most of them were made more than a hundred years ago, to deal with an issue that made sense back then, and have not been repealed because they are not enforced; heck, few people even know they exist. Here is a blog listing some laws so strange that one wonders what folks were thinking when colonial or state governments passed them. No state gets off scot-free here, so if you don’t want a crazy law for your place, you’d better be living in DC, a US territory, or abroad. Rather than give details from the article, I’ll just say that the one picked for Florida would have gotten me in trouble almost every day when I lived there, and if the one for Kentucky was enforced, the Kentucky Derby wouldn’t be the same. I’ve been out of town for two days, leaving on Thursday evening, and coming back Saturday afternoon. Now I’ve rested up enough to tell you where I’ve been. 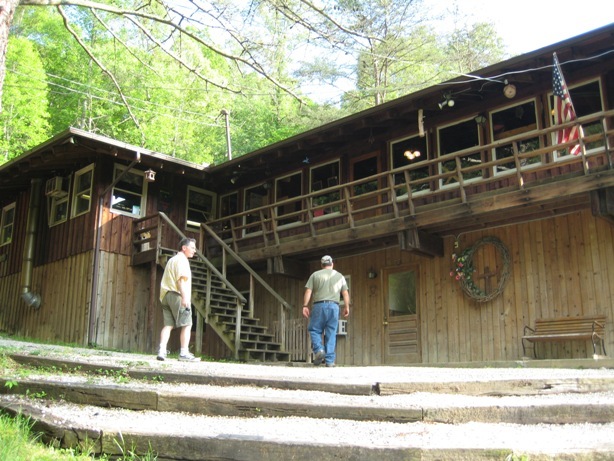 The men of my church had a retreat at Aldersgate, a very nice campsite run by the Methodists, in the eastern part of Estill County. 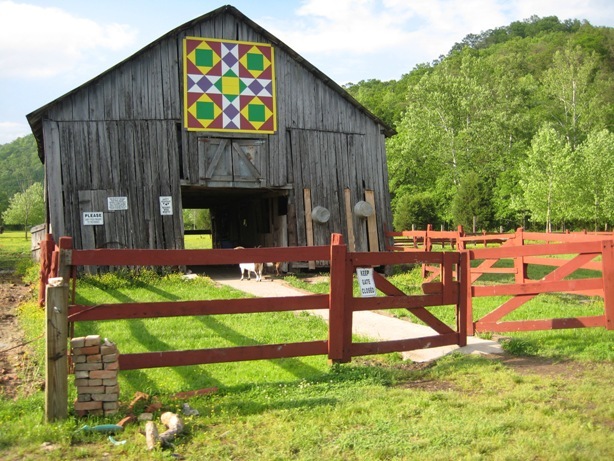 The nearest community is Ravenna, KY, and it is just over an hour’s drive from Lexington. The link above will give you an idea of what the place looks like, and I plan to post some pictures later this week. I have also added a brand new page to this blog. New pages haven’t appeared lately; I believe the previous one went up last September. 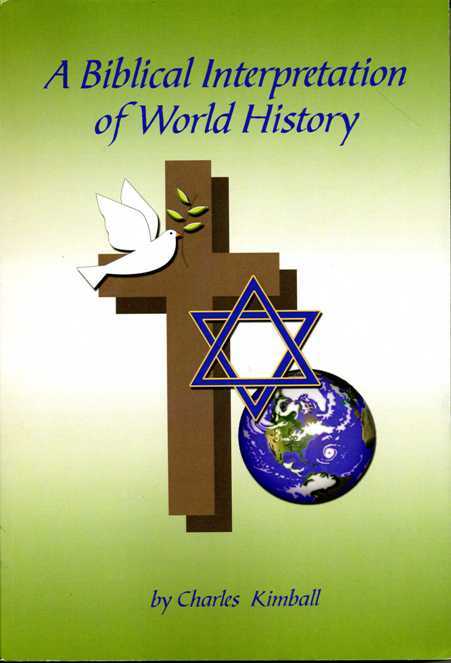 Anyway, it’s called “Odd History,” and it provides quick links to the offbeat history lessons I have posted here. To access it, click on the link below, or go to the tabs at the top of the screen.